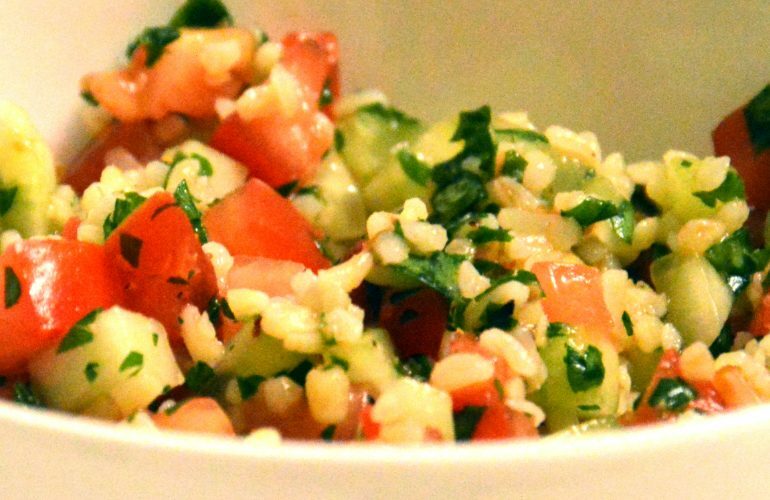 Tabbouleh traditionally is served as a part of a mezze (section of small dishes, starter). The name of a salad comes from Arabic word “taabil” and it means seasoning. Walking along Dubai we were wondering were we can eat a camel. I know – it may sound terrible – but for this one time we really wanted to try it. We walk into a small restaurant just infront of the old town and we sat down. It was very sunny afternoon and although camel meat was nothing special – Tabbouleh definitley was. It is extreamly healthy salad, very refreshing. 1. Cook bulgur for about 7 minutes in salty water, rinse and drain. 2. Mix in one bowl parsley, mint, cucumber, tomatoes, bulgur, olive oil and spices. 3. Serve as a strater or side dish with for example beef shawarma.